Sorry for the lack of posts recently! My brother's wedding is this Saturday, and not only have I decided that I'll make all of their wedding presents, but I also volunteered to make a 13 metre wide photo wall for the reception, and am writing a guest post (plus I have work and a family...)! So I do have a LOT to show you, just now enough time to write the posts yet! But soon :) In the mean time, some procrastination! SO much awesome here! I actually already made this! And it is seriously delicious. So easy, and I bet you already have the ingredients in your kitchen. Found over on Babble. 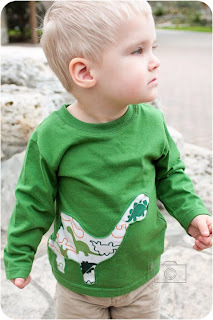 You know my boy loves all things dinosaur! I want to try one of these tees for Ethan. The reverse applique on the left is from Pure Joy, and the one on the right from my friend Kathryn over at Aiming for Swan Like (who is also my go to friend for all kinds of sewing advice!). These eclairs look so delicious, but for the first time I feel like I could actually make these! Found over at The Daily Smash. Such a great step by step! These "sock-topuses" are such a great idea! I have lots of odd socks I can't bear to throw away that would be perfect for this, and our no spend summer! Images here. Finally, I love these gift tags from Ilovedieline Studio on Etsy. 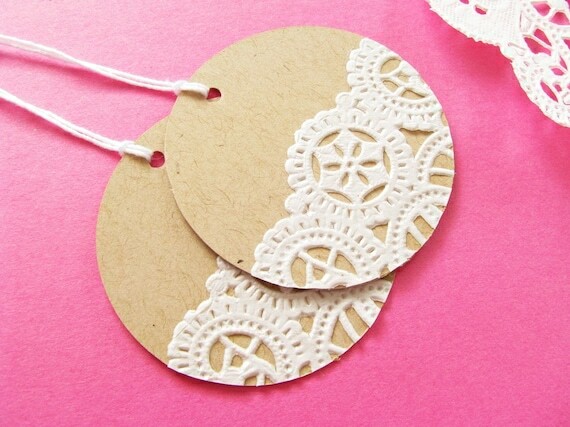 So cute, and you could totally DIY these yourself if you had the time, some cute paper and doilies and you're away! Have a great week! We're off to the beach today, hubs has taken a day off before the summer holidays start so we can enjoy the beach free from school children! :) I'll have an ice cream for you!